This article is part 3 of a series. We recommend you read part 1 and part 2 first. 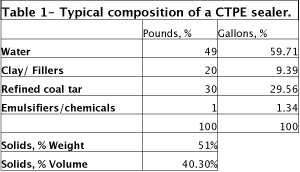 It is noteworthy that the concentrated CTPE sealer (as supplied to contractors) contains about 59% of water by volume whereas by weight it is only about 49 %. 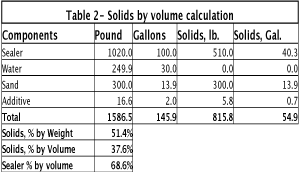 From this point onwards, we will focus only on solids by volume, not by weight. After application, water and other volatiles evaporate from the coating, leaving behind the solids i.e. coal tar, clay/fillers and additives after full cure. All coatings that cure by releasing volatiles shrink in volume on full cure. A coating that contains nearly 60% water will shrink down to 40 % of its original volume. We will deal with film shrinkage by volume, in a later section. - 1st. Coat @ 0.12 gal of conc. sealer /sq. yd. - 2nd. Coat @ 0.08 gal of conc. sealer/ sq. yd. - 1st Coat @ 0.18 gal of pre-mixed sealer/ sq. yd. - 2nd. Coat @ 0.12 gal of pre-mixed sealer/ sq. yd. Total @ 0.30 gal of pre-mixed sealer/ sq. yd. for two coats. In the calculation, based on pre-mixed gallons of the sealer, the quality of the pre-mix has been increased to keep the required amount of the concentrated sealer in the mix. We will now examine how the quantities of the sealer and other ingredients will be affected. The following calculation will show the relationship between the amount of concentrated sealer needed as compared to the amount of pre-mix that will be needed. Example for conc. sealer and materials required. Suppose area to be sealcoated is 10,000 sq. yards. - 1st. Coat @ 0.12 gal/sq.yd. = 0.12X10,000 = 1,200 Gals. - 2nd. Coat @ 0.08 Gal/sq.yd. = 0.08X10,000 = 800 Gals. Total gals. of concentrated sealer needed for the job = 2000 gals. Coverage Rate, therefore, is = 2000 gals./10000 sq. yds = 0.20 gal/ sq. yd. Sealer (Conc.) - 2,000 gals. Water @ 30 % dilution - 600 gals. Total volume - 2,970 gals. Total gals. of pre-mixed sealer needed for the job= 2970 gals. Coverage Rate, therefore, is = 2970 gals./10000 sq. yd. = 0.297 gal/ sq. yd. The ratio of coverage rates pre-dilute vs. concentrated = 0.297/0.20 = 1.49. It is, therefore, evident that you will have to apply approx. 50% more gallons of the mixed sealer./sq. yd., in order to get the right amount of concentrated sealer on the pavement. Contrarily, if you apply the mixed sealer at the rate as recommended for the concentrated sealer, you will be applying 33% less sealer than required. That may result in reduced longevity of the sealcoating. Coverage rates and mix designs dictate the quantity of actual sealer deposited, and more precisely how much bitumen (the component in the sealer that protects the pavement). Any deviation from recommendation, in the amount of the bitumen actually applied on the pavement may result in inferior performance or even failure of the sealcoating. In deciding which mix design to use, several factors, e.g. the age and condition of the pavement, intended use, etc. are taken into account. Such mix design considerations have evolved through many years of research and field experience and are recommended by the sealcoating manufacturers as well as several local, state and federal agencies. Any alterations should be carefully evaluated and must be pre-approved by the customer. The calculations noted above are only for illustration purposes and shall not be construed as universally accepted mix design. Planning ahead is important! Cars shall be removed prior to sealcoating parking lots!! The coverage rate, as defined in the coatings industry, simply states the surface area covered by the unit volume (gal.) of a coating material. For example if 100 gallons of sealer are needed to sealcoat 5000 sq. ft of asphalt pavement, the coverage rate will be 50 sq. ft per gallon. Sealcoating manufacturer’s specified coverage rates shall be strictly adhered, to obtain the optimum performance for a project. Coverage rates are expressed in two different ways, which are interchangeable through simple mathematics. 1. Squares Feet Per gallon (Sq. Ft./ Gal) i.e. area in square feet, covered by a gallon of the sealcoating. 2. Gallons per square yard (Gal./ Sq. Yd.) i.e. gallons required to cover one square yard of the pavement. This is the more frequently used method in our business, presumably for the sake of quick calculation to determine the gallonage needed for a large area. Conversion from Sq. Feet/ gallon to Gallon/ sq. yard. - Convert sq. ft. to sq. yd; Divide sq. ft by 9 to get sq. yard (1 sq. yard is 9 sq. ft.) Example: 50/9 = 5.55 sq. yd. - Divide 1 by sq. yd = 1/5.55 = 0.18 gallon /sq. yard. - Multiply this figure with 9 to get the conversion = 5.55 x 9 = 50 sq. ft./gal. In discussing coverage rate, we have thus far mentioned two elements only, surface area and volume. Surface area is expressed either in square feet or square yards and the volume in gallons. Film thickness, which is crucial to understanding sealer performance, is the third factor to be discussed. A gallon is a unit for expressing volume, a three dimensional entity. Area, on the other hand, is only two dimensional i.e. length and width. In order to complete the equation we must introduce the third dimension, thickness. The term 'film thickness' means the thickness of the coating deposited on the pavement as a result of the application. The film thickness of the freshly applied sealer is termed 'wet film thickness' and after full cure 'dry film thickness'. The coverage rate and film thickness are inter-related. When we mention coverage rate, we are actually indicating film thickness or vise-versa. For example, a coating applied at 50 sq. feet per gallon is twice as thick as the one applied at 100 square feet per gallon. Film thickness is calculated from the coverage rates and is expressed as 'mils', a unit for expressing the thickness of thin films. One 'mil' is one thousands (1/1,000) of an inch. Conversely, one inch is equal to 1,000 mils. 2. Divide the Square feet /Gallon into 1604 to get the wet film thickness in mils. (1604 is a constant, a gallon of coating will cover 1604 sq. feet in one (1) mil. Film thickness). Example: Determine the film thickness for a two sealcoats applied at total coverage rate of 0.20 Gal/sq. yards. per gallon. - Convert Gal./ sq. yd to sq. ft./Gal. - Multiply with 9 = 9 X 5= 45 Sq. ft./ Gal. - Wet film thickness = 35.64 mils. Similarly, the wet film thickness of the individual coats can be computed using the same procedure. - 1st coat coverage 0.12 Gal./ sq. yd = 75 sq. ft./ Gal. - Wet Film thickness = 1604/75 = 21.38 mils. - 2nd. coat coverage @ 0.08 Gal. sq. yd.= 112.5 sq. ft/Gal. - Wet Film thickness = 1604/112.5= 14.26 mils. Total of two coats = (21.38 + 14.26) = 35.64 mils. The shrinkage in volume is manifested directly as shrinkage in the thickness of the wet film because it is the only dimension available in which the coating can shrink. The coating is already bonded to the other two dimensions i.e. the area (Length x Width) from where, hopefully, it will not pull away. For example, 0.20 gal of the sealer applied over an area of one square yard will still continue to cover one square yard area, only the film thickness will shrink upon full cure. 1st coat application @ 0.12 Gal. /sq. yd. - Dry Film Thickness (37.6 % of 21.38)= 8.00 mils. 2nd Coat Application @ 0.08 gal./ sq. yd. - Wet Film Thickness = 14.26 mils. - Dry Film Thickness (37.6% 0f 14.26)= 5.36 mils. Total of two coats @ 0.20 gal./sq. yd. It is very important for you to know the amount of the sealer that will stay on the pavement after the sealer has fully cured. The most convenient way is to express it is in terms of the dry film thickness. A sealer that contains only 30% volume solids (meaning more water in the mix) will shrink to 30 percent of its wet film thickness. The use of large amounts of water in the mix design shall be avoided as they will produce thinner dry films thus likely causing premature wear and failure of the sealer. We have established that solids by volume content of a mix design and the application at specified coverage rates are major aspects that determine the overall performance of a sealcoating system. That is not all, it is essential to know what the solids are actually comprised of i.e. the proportions of sealer, water, sand and additives, in the mix design. Keep in mind that coal tar is the component that provides protection to asphalt, and its proportion shall not be short-changed in the mix design. The other ingredients, though indispensable in certain mix designs, are there to add some other features. For example sand imparts anti-skid properties; additives help drying properties and enhance the resistance to chemicals, salts, oils, and so on. Still the bitumen is the backbone on which other features can be effectively built. • reduce adhesion. Sand absorbs the binder (coal tar) from the sealer. With increasing amounts of sand in the mix design, a stage is reached where sufficient binder is not available to bond to the pavement, resulting into adhesion failure of the sealcoating. It is easy to visualize when you consider that the bitumen is the binder portion of the coating, which while performing its primary function of protecting the pavement, also holds the fillers in the coating system. Silica and other fillers absorb the binder to satisfy their own absorption demands, thus reducing the proportion of the bitumen, which should be otherwise available for forming a continuous film of the sealcoating and bonding to the pavement. Therefore, proper care should be exercised in designing of sealer mixes, and excessive amounts of silica sand should be avoided. Many years of research and field experience have concluded that the limit is reached when filler volume approaches to equalize with the bitumen volume. In other words, the ratio of bitumen solids by volume to filler shall not be allowed to exceed one to one (1:1). The proportion of bitumen solids should be a bit higher for continuous film formation as well as proper adhesion to the pavement. In the mix designs exemplified above, the mix design no. 2 represents the limit, and we recommend not exceeding it. The use of excessive amount of water shall always be avoided as they directly reduce the solids by volume of the mix. Reduced solids result in a thinner dried film, which can not be expected to have the same longevity as unadulterated material. Manufacturers recommendation shall be followed. The amount of water can be exceeded slightly if the pavement surface is hot. Extra water is better used not with the sealer but for fogging to cool the hot pavement. Additives have been in use for many decades in sealcoating industry. Their primary function is to reinforce and enhance the properties of the sealcoatings. There are many additives on the market for very specific purposes. It is the responsibility of the sealcoating professional to determine which additive will best compliment the given project. The additive manufacturer can be a great source for assistance, and their recommendations shall be strictly followed. The limitations of additives and their specific contribution to the overall performance must be objectively evaluated in light of the added cost and longevity of the sealcoating. Additives, though an invaluable component, shall not be expected to overcome performance deficiencies caused by excessive use of water or silica sand in the system. Additives will neither enhance the film thickness nor add binder to accommodate excessive filler content. Understanding of the basic of sealcoatings is essential for the sealcoating professional as well as their customers, to get the best in pavement protection and preservation. Sealcoat performance can be assured through proper formulation of the mix designs and following the guidance offered by the sealcoating manufacturers, as well as various other specifications arrived at by the ordering agencies. Excessive dilution of the sealer or use of excessive amounts of silica sand shall be avoided and used only with the knowledge and understanding of all parties involved. It is the dried film of the sealcoating and more importantly what constitutes that film that dictates the performance. Again, the bitumen in the dried film is the backbone of the sealcoating material and it should not be over-taxed.